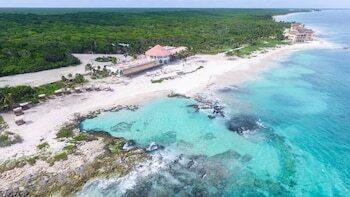 When you stay at Hotel Caleta Tankah in Tulum, you'll be by the sea, within a 15-minute drive of Tulum Mayan Ruins and Xel-Ha Water Park. The front desk is staffed during limited hours. A roundtrip airport shuttle is provided for a surcharge (available 24 hours), and free self parking is available onsite. A stay at Hacienda Todos Los Santos places you in the heart of Todos Santos, steps from Los Pinos Park and 3 minutes by foot from Logan Gallery. Free self parking is available onsite. With a stay at MayaYoga Hostel in Tulum (Tulum City-Centre), you'll be within a 15-minute drive of Tulum Mayan Ruins and Tulum National Park. Free self parking is available onsite. Located in Oaxaca, Hotel Arisa Oaxaca is within a 10-minute drive of Technological Stadium of Oaxaca and Oaxaca Institute of Technology.